Many of us can relate to the feelings aroused when finding an old ticket – feelings perhaps of nostalgia or excitement, or more negatively, of a long-dreaded journey or disappointing event. Whether the ticket is physically rendered in paper, as a wristband, or as a digital QR code accessible only via a mobile phone; whether it is an embossed handwritten pass, an automatically generated ticket from a machine, or an A4 printout with crinkled edges from being hastily stuffed into your pocket, their purpose, and their relationship with the user is consistently similar. As essentially ephemeral objects, tickets have the ability to transcend their initial material purpose – to grant access to an event, product or service – and render themselves immaterially in the minds of their users through their mobility and imbued meaning. 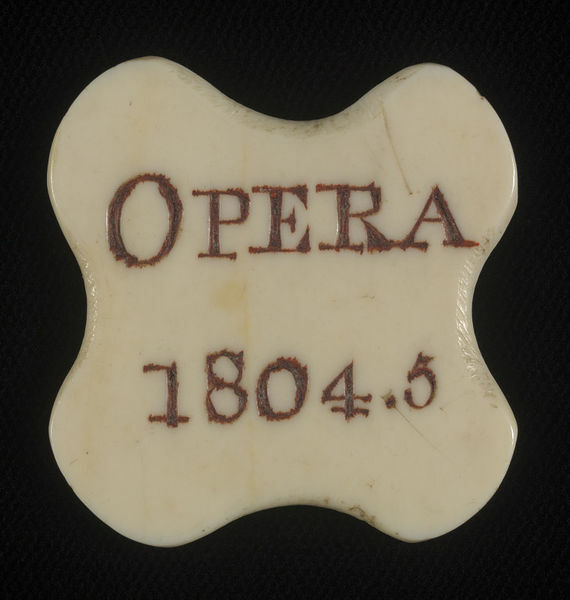 For my first term essay on the V&A/RCA History of Design programme I chose to study an ivory opera token from 1804-5, held in storage by the V&A Theatre & Performance Archives at Blythe House – see Fig. 1. 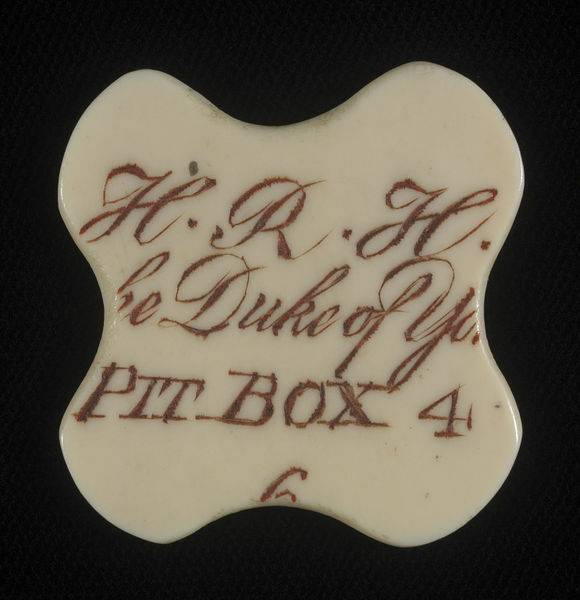 This token, which acted as a subscribers pass for the Duke of York’s box, Pit Box 4, at the King’s Theatre, Haymarket, for the operatic season of 1804-1805, allowed me to explore the concept of the ticket as a material thing that acts not only as a transmitter of goods or services, but as something that can be imagined beyond its mere functional physicality; its biography, agency, and meaning. What I wanted to argue, therefore, was not only for the central role of material culture in attending the opera during the early nineteenth century, but more generally, for the need to reassess our scholarly understanding of objects frequently dismissed as being simply ephemeral by exploring notions of touch and impassivity, the mobility or ‘flow’ of an object, and the materiality of the ticket within its surrounding network. Fig. 1 – Front and Back of token: Ticket, ivory, 1804 (made), S.44-2005, Theatre and Performance Collection ©Victoria and Albert Museum, London. The token is made of ivory, carved asymmetrically into a four-lobed quatrefoil, and engraved with dark red ink, measuring at its widest point (diagonally) four and a half centimetres, and at its narrowest point (measured across the centre) three centimetres. On one face is engraved and filled with ink ‘Opera, 1804.5’ and on the reverse ‘H.R.H. the Duke of York, Pit Box 4, 6’. Originally the token would have been oblong or oval, as appears to be the common shape from other tokens, and has therefore been carved into its present shape at a later date. Designed to be worn by pinning to or hanging over clothing, the weight is similar to a small piece of jewellery, and so of minor inconvenience to the wearer. The V&A holds a number of tokens (ranging in material from ivory to copper), but certainly what attracted both me and the V&A in its initial acquisition was its carving into a quatrefoil, evidently the work of an amateur given its asymmetry and the cutting-off of details of the engraving. The reasons for its carving are unclear and thus open only to speculation, perhaps the hole used to hang ribbon through typically found at the top of tokens was broken – being a potential weak point -, and so was carved to mask this damage; it may have been carved by the user directly so as to differentiate their token from the other five; or carved at a later date by a subsequent owner, its attempt at a novel shape suggesting possible mounting in a display cabinet. Typically in November or December, ‘a genteel invitation to subscribers to pay in their money at the company’s bank’ was sent out, who would then pay either upfront at the theatre’s bank in Pall Mall or in a series of three instalments over the course of the season. From here, the details of these subscribers would be passed to the toyman (an archaic term for an ivory carver), who would carve and engrave the required number of passes with the names of the proprietors, before returning them to the banking house on the Mall where they could be picked up. The token would be collected, and subsequently worn for each respective performance attended, where it would be checked by an attendant, presumably for authenticity, but also to ensure guests found their seats. Once used for the season, the ticket would be no longer be of practical use, becoming functionally useless. Fig. 2 – ‘Proscenium of the Opera House / Entrance in the Haymarket’, The Illustrated London News, 11 October, 1816, The British Museum, Prints & Drawings, EE.6.13. The auditorium’s structure facilitated the intricate social geography of the elites, serving ‘as a site in which to nurture the social networks that supported the patronage system, to showcase the female social door-keepers, and to engage in status performances that could confirm a family’s prestige and clout’. Evidently, the display of the patrons, rather than the performers was key, achieved through the panoptic construction of the house, ‘transforming the crowd [audience] into a constantly surveyed, self-watching, self-regulating’ microsomal society. Boxes, despite their intimate nature, were semi-public spaces that granted both a marker of wealth and status, as well as the ability to see and be seen – see Fig. 2. Box-holders simultaneously became consumers of the spectacle of the auditorium, and a product to be consumed. The line-of-sight granted by the boxes is of unparalleled importance in the act of self-display; whilst the view of the stage is somewhat poor, the view of the other boxes and of the stalls is first-rate, especially when used in conjunction with the opera-glass. These ubiquitous seeing objects are an example of how display in the auditorium could further be mediated by material objects. The Duke of York, to whom our token belonged, along with his older brother the Prince of Wales, chatted and flirted their way through most performances, frequently noted by both the press and other operagoers. Like the Prince, the Duke courted his fellow patrons within the social hierarchy, playing the part of the fast young royal (despite his age), enacting the central process of self-display in opera attendance. When in 1809 it emerged that his mistress, Mary Anne Clarke, was selling commissions and promotions in the British army, this startling revelation for the Duke, then-commander in chief of the army, later resigned. When the prosecutor questioned the Duke about his relationship with Clarke and where they had first met, he replied the opera house ‘in the presence of other respectable gentlemen’. Unfortunately for the Duke, his attendance would be entirely undeniable and have would undoubtedly have been seen with Clarke – a result of the visibility granted by the boxes. The token reminds us that whilst offering its patron entry to an arena in which to act out their social agenda, they remain bound to the heavily codified environment that it represents. Tokens existed as a ‘material presence’, their holders themselves had to make arrangements to collect it or they would forgo their entry, and that of their invited guests. Those within the boxes then assumed the identity given to them on their token, they were for that evening or for the whole season Mr or Mrs x, of box y at the King’s Theatre. For those guests in the boxes occupied by the most elite, they assumed an identity other than their own, solidifying the hierarchy that was the foundation of the opera house. The tokens therefore demanded and controlled behaviour from both patron and institution, the latter again involved with door-keepers who would take the token into their hands and read the information, employing institutional know-how in order to direct the patrons to their seats. All these behaviours were dictated by to the token to its handler, and the amount of agency possessed by something that hitherto has been disregarded as simple ephemera is remarkable. In lieu of a proper conclusion, I would like to instead offer a postscript – an extension of the token’s life beyond its current storage at Blythe House. In February 2016, as part of our student-led ‘Reimagining Objects’ exhibition at the RCA’s Hockney Gallery, a plan of the boxes of a fictional opera house was mounted on the gallery’s wall, to which were affixed twenty ‘tokens’, one in each box – see Fig. 3. Made of inexpensive card and with text realised through spray paint, the material was a deliberate subversion of the ivory and ink of the original token. For the private view, however, the token took centre stage, whereby attendees were each given one to be worn around their necks with twine, the date inscribed on the reverse side. These tokens acted as veritable passes, not to the opera, but instead as a free drink token to the college’s own interpretation of the hedonistically social realm of the early nineteenth-century opera house – the Art Bar. Fig. 3 – ‘Opera Tokens’, Reimagining Objects, February 2016, image courtesy of Melissa Tyler. Curtis Price, Judith Milhous, and Robert D. Hume, Italian Opera in Late Eighteenth-Century London: The King’s Theatre, Haymarket 1778-1791, vol. 1, (Oxford: Clarendon Press, 1999), 135, and Ian Woodfield, Opera and Drama in Eighteenth-Century London: The King’s Theatre, Garrick and the Business of Performance, (Cambridge: CUP, 2001), 190. Jennifer Hall-Witt, Fashionable Acts: Opera and Elite Culture in London, 1780-1880, (Durham, NH: University of New Hampshire Press, 2007), 109. Tony Bennett, The Birth of the Museum: History, Theory, Politics, (London: Routledge, 1995), 69. Simon Goldhill, Victorian Culture and Classical Antiquity: Art, Opera, Fiction, and the Proclamation of Modernity, (Princeton, NJ: Princeton University Press, 2011), 102. Gillet, T., Printer, Crown Court, History of the Proceedings of the House of Commons in the Inquiry into the Conduct of His Royal Highness, The Duke of York, comprising an authentic copy of the evidence, and an accurate report of all the debates in Parliament, as they occured in order of time, (London: John Stockdale, Piccadilly, 1809), 153. Sarah Lloyd, ‘Ticketing the British Eighteenth Century: “A thing … never heard of before”, in Journal of Social History, 46:4, (2013), 844. Judy Attfield, Wild Things: The Material Culture of Everyday Life, (Oxford: Berg, 2000), 245. Mark Miodownik, Stuff Matters, (London: Penguin, 2014), 54. Lloyd, ‘Ticketing the British Eighteenth Century’, 859, 861. Scott Bryan, ‘13 Reasons Why It’s Actually OK To Not Cut Off Your Wristband’, Buzzfeed, 1 July, 2015, http://www.buzzfeed.com/scottybryan/trust-me-you-want-it-left-on, (accessed 05/01/2016). Lloyd, ‘Ticketing the British Eighteenth Century’, 861.